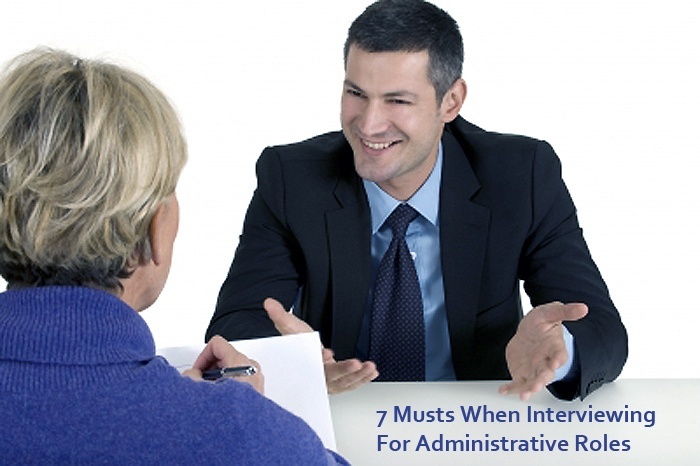 Administrative staff: they are often the first person you meet when you walk into an office. Their responsibilities usually include: answering calls, managing calendars, meeting management, event planning, completing reports, greeting clients, managing correspondence, project coordination, maintaining the office, and much more. They interact with people at every level of a company, they always seem to have a finger on the pulse of the organization and they are usually a company’s backbone. As such, interviewing for an administrative position requires unique preparation. Here are 7 musts when getting ready for your interview. 1. Know the role. Be sure to study the job description before the interview. While there are many similar responsibilities across different administrative roles, they can also vary greatly between departments, companies, and industries. Understand what is expected for each unique opportunity and know how the role fits into the team and company. 2. Research the organization. Have a clear idea of the company’s mission. It is important to know what a company does and you should have an understanding of how your potential role will support how the team achieves company goals. Leverage your research by placing your previous experience in the right context and by asking appropriate questions. 3. Get to know your interviewer and the person/people you’ll be supporting. Complete an Internet search, look on LinkedIn, see if you have common connections, and check the company website to get an idea of your interviewer’s backgrounds and career. This will help you get a sense of their personality, accomplishments, and areas of focus. This will give you an opportunity to ask more relevant questions. 4. Refresh your software skills. Knowledge of, and experience using software such as Excel, PowerPoint, Word, and Outlook are often required for administrative positions. Refer to the position description to determine what software skills are needed and spend some time using each program. If you need a reminder on how to complete specific tasks, try searching Youtube. There are thousands of “how to” videos on just about every Microsoft Office trick and tip you can imagine! 5. Review your resume. Your interview is the time to elaborate on your experience and bring those bullet points to life! Know your resume so you can expound on previous positions and what you’ve learned from them. This will also provide the opportunity to highlight themes and identify how your history has prepared you to succeed in this administrative role. 6. Know your process. Being a member of the administrative staff requires a lot of organization. Know your process and be able to explain how you track projects, prioritize responsibilities, and manage your time. Understanding your own process and sharing that with the hiring manager might be the most critical aspect of your interview. Administrative roles are critical to the success of any organization. These positions require specific personal, customer service, and organizational skills, so being prepared for your interview and highlighting the right experience is critical to your success. If you’d like to connect to top recruiters and staffing experts in the Chicago area with in-depth knowledge of administrative roles, visit our website to learn more or apply now!